Review JetBlue baggage allowances and fees before travelling. If you are moving abroad or across the country and need to bring much more with you than the standard JetBlue baggage allowance permits, you can simply send everything with Send My Bag. Just pack your items in a suitcase(s) or box(es) and have it all picked up from home and delivered to your destination. That way you can hop on your flight with just your handbag. Get a free quote for luggage shipping. The JetBlue carry-on allowance includes one carry-on bag no bigger than 22 x 14 x 9 in (55.88 x 35.56 x 22.86 cm), plus one personal item, which must not exceed 17 x 13 x 8 in (43.2 x 33 x 20.32 cm). If a passenger’s carry-on bag does not fit in the overhead locker, the bag will be checked at the gate. There is no JetBlue baggage allowance for infants sitting on an adult’s lap. However, the accompanying adult may bring a diaper bag, pushchair and car seat for the child, as well as their own carry-on items. A musical instrument can be brought on board as carry on provided it fits within the overhead lockers (standard carry-on dimensions do not apply). If an instrument does not fit, an extra seat can be purchased for it. The instrument must weigh no more than 165 lbs and it must be placed in a window seat. Certain domestic pets can be brought on board the aircraft, and placed, in their carrier, under the seat in front. Passengers are allowed to bring only one pet on board, and a maximum of four pets may be present on board a flight. A pet must be in a carrier with dimensions that do not exceed 17 x 12.5 x 8.5 in. The combined total weight of the pet and its carrier must not be greater than 20 lbs. A carrier counts as one carry-on item. The fee for bringing a pet on board is $100, one way. 1 x 50 lbs (22.68 kg); maximum dimensions of 62 inches (157.48 cm), free on Blue Plus and Blue Flex fares; $30 on Blue fares. 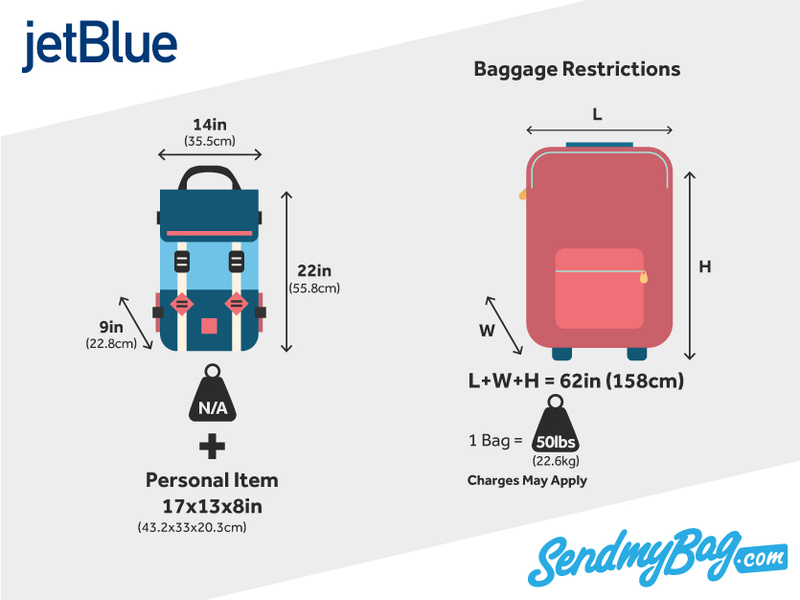 A second checked bag costs $40 on Blue and Blue Plus fares (free with Blue Flex), and a third, or any additional bag, costs $150. Mint fare passengers are allowed two checked bags up to 70 lbs (31.7 kg) each. If a bag is over the weight permitted by JetBlue’s checked baggage allowance, $100 per bag will be charged. If a bag is oversized, the charge is also $100. No bag larger than 80 in or heavier than 99 lbs will be accepted. If a bag is both overweight and oversized, the two fees will apply. Exceptional items, such as sports equipment, are accepted as checked luggage, and often without additional fees being charged. You will not be required to pay extra to check a golf bag, for example, as long as it does not exceed weight limitations. Bicycles, however, generally incur a fee of $50, one way. Overweight baggage fees will not be charged for bikes, but they must not exceed 99 lbs. Musical instruments may be checked into the hold as desired, and count as one item of checked luggage. No additional fees are charged for musical instruments, provided they are within size and weight restrictions. Looking for Jet Blue sized hand luggage?